A fabulous roomy 3 bedroom apartment in exclusive Aigua Blava Bay, Catalunya. A 5 minute walk from the Mediterranean and a salt water swimming pool carved in the rocks (private to the apartments and continuously refilled). Sunbathing platform with steps into the sea. The ground floor apartment is set in a beautiful landscaped garden full of olive, lemon and pine trees. It sleeps 6 people comfortably (up to 8 with bunkbeds for children) and has 2 bathrooms, a cool spacious sitting and dining room with wifi and an extremely well equipped kitchen. Aigua Blava bay is about 1 hours drive from the French border. 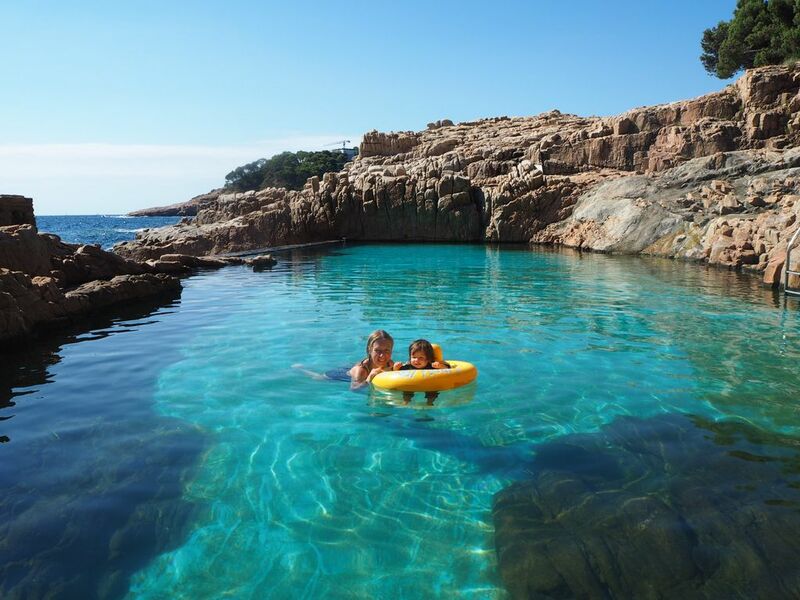 Known as 'Catalunya Verda', this region of the Costa Brava has an attractive pine forested rocky shoreline with many small bays and beaches. We live in England but we spend the bulk of our holidays in Spain at the apartment with a third generation now enjoying its uniquely lovely setting. We are a brother and two sisters whose parents bought the apartment in the 1960s when they fell in love with the place after numerous stays at the nearby Aigua Blava Hotel. Aigua Blava is an unspoilt village which in spite of the Spanish building boom has stayed pretty much the same as it was when our parents first came. It is a million miles away from the popular concept of a built-up, touristy Costa Brava. The apartment is only an hour's drive from Girona airport and a short drive from nearby towns. The flat is minutes from the pool and the Mediterranean. We provide everything you need to travel light, the kitchen and bathrooms are bang up to date, plus there is wi-fi for anyone who wants to check emails or make a Skype call home. And if you are visiting out of season, there’s a wood-burning stove to keep things cosy on cooler nights. Aigua Blava has a charm and magnetism which keeps people coming back year after year. And because the apartment is genuinely a family flat as opposed to a commercial property, it is better equipped than most holiday rentals and feels like a real home from home. Bathroom 1 with wc, basin, bath and separate shower. Bathroom 2 with wc, shower and basin. Cool roomy living/dining room with 2 large settees, a wood burning stove for winter and a well stocked library. There is wifi, a CD player and a TV/DVD player. Please note the TV is for playing DVDs/games only - it is not connected to cable. Modern kitchen, with a mains electric oven and hob, generously equipped to cater for up to 8 people. 10 golf courses within easy reach. Notes on accommodation: There is also a travel cot, high chair and baby buggy. Sorry, no animals. Outside: The sitting room and master bedroom open on to a large sunny terrace with cane furniture and a long cushioned bench seat looking south across the garden to the sea. The garden leads down to a salt water swimming pool (mid June/mid September only) and steps into the sea. A numbered parking space is provided in the underground garage and there is additional parking at the top of the steps leading to the apartments. Utility Room: Utility room with fridge/freezer, dishwasher, washing machine and tumble dryer, vacuum cleaner. Cleaning / Towels / Linen / Maid service: The apartment is cleaned at each changeover. Linen and towels are provided. A beautiful apartment in a wonderful location. Ideally located for numerous beaches and the pretty village of Begur. The apartment is well resourced and comfortable but there is often an overpowering smell from the bathroom drains which you have to adjust to. Access to the sea water pool associated with the Es Cau complex is not guaranteed and it was not available when we stayed. This was disappointing. Luckily there are beaches nearby. This was our fifth stay here in the past 10 years. I think that says everything about how we feel about this place - which is located in one of the most beautiful stretches of coast in the Mediterranean. The apartment is spacious and has a great terrace with a sea view to enjoy a coffee in the morning and a bottle of wine in the evening. We also like how well equipped the kitchen is - unlike so many rental apartments and is a reflection of the fact that the owners have spent a lot of time here themselves over the years as a second home. It's safe and friendly block which is well looked after by the community. I recommend it highly and we will definitely be back again. Thanks so much for your review. It's always a pleasure to know that our guests love the place as much as we do, and as ever, it was a very great pleasure to welcome you back. Aigua Blava is one of those places that once it has you, never lets you go! Platje Fonda is a deep beach with access by a long flight of steps and has good swimming (5 minutes walk). Platje Aigua Blava is a sheltered sandy, shallow beach, ideal for children, with a bar and 2 beach restaurants (5 minutes drive or 20 minutes walk by coastal path). There is a swimming/sunbathing platform by the Es Cau pool and another near the Aigua Blava Hotel. (2 hours), or Perpignon airport (1.5 hours). By road, take the motorway from La Jonquera on the Franco-Spanish border and C252 (about 1 hour from border). By rail, Motorail to Narbonne or RENFE to Gerona station and taxi to flat (about £10). By coach, SARFA from Barcelona (2 hours) or Gerona city centre (1 hour) to Begur, and taxi to Aigua Blava. Car hire not essential but recommended. Sports facilities: excellent swimming and snorkelling, windsurfing, waterskiing, sailing and scuba-diving, plus an extensive network of well marked local footpaths for walkers. The Pyrenees (1.5 hours drive) offer hill walking, climbing, pony-trekking, hang-gliding and skiing in season. Printed brochure or e-brochure available on request. Culture: Catalunya has an unbroken history reaching back to the Phoenician, Greek and Roman empires. Worth visiting are the archaeological sites of Ampuries and Ullastret, the medieval hill towns of Peratallada and Pals, the Salvador Dali museum and house at Figueres and Cadaques, the Gothic/Romanesque regional capital of Gerona, and of course Barcelona, one of the great cities of Europe. And don't miss La Bisbal - an entire town dedicated to the creation and sale of ceramics. Local services: there is a small but well-stocked supermarket in the village, as well as several bars and restaurants. Begur (2.5 miles), a small fashionable hill town, has bars, galleries, fancy shops and some excellent restaurants. Palafrugell (5 miles), a lively market town, has a wide selection of shops and services, including the emergency clinic, police station, banks and a central square with cafes and local festivities. The highlight is the superb daily food market from 8.00am - 1.00pm (except Mondays). Normal shopping hours are 8.00am - 1.00pm and 4.00pm - 8.00pm. Changeover Day: Our changeover day is Saturday. Arrival time 3pm. Departure time 10am.